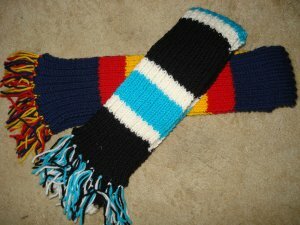 With this easy footie scarf pattern you will be able to make yourself a scarf in the colors of your favourite football team! This scarf was knitted on oversized needles (6.00mm) with 8 ply wool in a two by two rib and the result is a beautifully soft but light-weight scarf. This scarf is approximately 200cm long with the fringe and 12cm wide in its resting state. Normally a pattern would specify the number of balls of a particular yarn you should use to make the item. I used pure wool for my scarves and took between four and five balls of wool. The quantities will vary depending on the number of colors you want to incorporate into the scarf. To knit this footie scarf pattern, you will need a pair of 6.00mm single pointed needles (or the size required to give you the correct tension. The tension for this scarf is 30 stitches and 21 rows for a 10cm square. As these patterns are based on a two by two rib, the tension is measured when the knitting is in it's resting state. 1st Row: *K2, P2, rep from * to last two stitches, K2. 2nd Row: K1, P1, *K2, P2, rep from * to last two stitches, P1, K1. Repeat these two rows, incorporating your stripe pattern until your work measures 210cm. *Using your main color, knit 24 rows in two by two rib. Change to 1st contrast color and knit 6 rows. Change to 2nd contrast color and knit 12 rows. Repeat from * seven times. Change to main color, knit 24 rows in two by two rib. Change to 1st contrast color and knit 12 rows. Change to main color and knit 12 rows. Change to main color, knit 24 rows. Using your main color, knit 24 rows in two by two rib. *Change to 1st contrast color and knit 20 rows. Change to 2nd contrast color and knit 20 rows. Change to main color and knit 20 rows. *Change to 2nd contrast color and knit 20 rows. Change to 1st contrast color and knit 20 rows. If you are happy with your scarf the way it is, you have finished, but if you would like to add a special touch you can add a fringe. To do this cut 16 pieces of yarn of each color about 12cm long. To form a piece of the fringe take one strand of each color and fold them in half to form a loop. Using a crochet hook, draw the loop through the knitted fabric of your scarf and then draw the ends through the loop. Pull the fringe knot tight. Space eight fringe knots evenly across both ends of your scarf and you are done! Just in case you would like to print out a copy of this Footie Scarf pattern, I have created a pdf version of it that you can download.